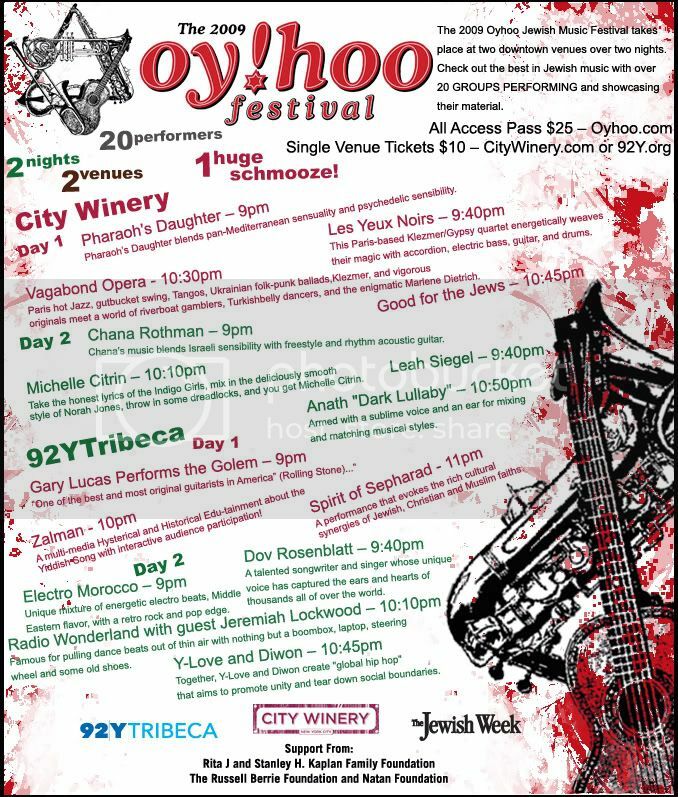 On January 13 and 14, The 2009 Oyhoo Jewish Music Festival takes place at three downtown venues over two nights. Check out the best in Jewish music with over 20 groups performing and showcasing their material. This years venues are City Winery, and 92Y Tribeca. One $25 all-access pass gets you into all venues for both nights. $10 Tickets are also available at each venue. Including Pharaoh’s Daughter, Les Yeux Noirs, Gary Lucas, Leah Siegel, Diwon, Dov Rosenblatt, Electro Morocco, Y-Love, Radio Wonderland with guest Jeremiah Lockwood and tons of other performers and special guests. Pharaoh’s Daughter – Pharaoh’s Daughter blends pan-Mediterranean sensuality and psychedelic sensibility thrilling audiences at festivals, colleges, clubs and concert halls. Basya Schechter leads this musical, poetic journey through swirling Hasidic chants, Sephardic grunge, and spiritual stylings filtered through oud, percussion, flute, strings, vocals and electronica. Vagabond Opera – Paris hot Jazz, gutbucket swing, Tangos, Ukrainian folk-punk ballads,Klezmer, and vigorous originals meet a world of riverboat gamblers, Turkishbelly dancers, and the enigmatic Marlene Dietrich. Les Yeux Noirs – For over twelve years, Les Yeux Noirs (The Black Eyes) have been carving their own path down the road of Yiddish and Gypsy music, adding contemporary rock instrumentation and energy. Led by the twin fiddling of brothers Eric and Olivier Slabiak, this French band is a celebration of history and life, guaranteed to have their audience smiling and dancing, captivated by the Gypsy spirit. Gary Lucas Performs the Golem – “Gary Lucas is the Semitic reincarnation of Jimi Hendrix” (Hamburg Morgenpost) … “One of the best and most original guitarists in America” (Rolling Stone)…”The Thinking Man’s Guitar Hero” (The New Yorker). Legendary guitarist Gary Lucas plays sold-out shows all over the world with this fantastic music and film project! Zalmen – A Musical Journey: The Yiddish Song With Zalmen Mlotek – Join Zalmen Mlotek, the Artistic Director of the country’s only National Yiddish-Theater Folksbiene, in a multi-media Hysterical and Historical Edu-tainment about the Yiddish Song with interactive audience participation! Chana Rothman – Chana Rothman has performed across north America, Italy, Israel and Nepal, where she trekked through the Himalayas with a guitar strapped to her pack. Originally from Toronto, Chana’s music blends Israeli sensibility with freestyle and rhythm acoustic guitar. Michelle Citrin -At just 5’1, it’s hard to believe that such a powerful voice could come out of Michelle Citrin. Anath “Dark Lullaby” – Armed with a sublime voice and an ear for mixing and matching musical styles, singer, songwriter Anath produces music that can speak to a universal audience. Dov Rosenblatt – Dov Rosenblatt, 27, is a talented songwriter and singer whose unique voice has captured the ears and hearts of thousands all of over the world. Since 2001, Dov has recorded and performed with his band, Blue Fringe, a popular Jewish rock quartet hailed by Jewsweek.com as “nothing short of a cultural phenomenon,” having sold over 30,000 albums worldwide and toured the U.S, Israel, Australia, South Africa, and the UK. ELECTRO MOROCCO – Electro Morocco is a unique mixture of energetic electro beats, middle eastern flavor, with a retro rock and pop edge. Their live performance combines live music with synced video clips that creates an unforgettable visual and musical experience. “Electro Morocco is what I would imagine would happen if Gwen Stefani met JUSTICE”. Radio Wonderland with guest Jeremiah Lockwood – Front man of The Sway Machinery and frequent collaborator with Balkan Beat Box, Jeremiah Lockwood, joins award-winning downtown composer Joshua Fried’s RADIO WONDERLAND project , famous for pulling dance beats out of thin air with nothing but a boombox, laptop, steering wheel and some old shoes. For this one of a kind duet, expect real-time media mashups, digitally-damaged groove-ology and soaring cantorial vocals. Y-Love and Diwon – Y-Love and Diwon are part of the new guard of hip hop revolutionaries. Y-Love’s rhymes seamlessly intertwine English, Arabic, Hebrew, Aramaic, and Latin, combining ethereal scripture with gritty social consciousness; Diwon’s beats fuse electro hip hop with traditional Yemenite and Sephardic music. They have performed with luminaries as varied and respected as Lou Reed, Anthony Coleman, Idan Raichel, DJ Spooky, Matisyahu, Steinski, and Immortal Technique. Together, Y-Love and Diwon create “global hip hop” that aims to promote unity and tear down social boundaries.